Fertilizer on new grass is important for its development, but applying it at the right time makes all the difference between a successful and a failed lawn. Fertilizers will help the new grass seeds germinate, and then they will feed its newly developed roots once they form. As the new grass emerges from the soil, fertilizers will give the grass a rich green color, increase its growth and make the new grass grow into a thick turf. Selecting a fertilizer formulated for a new lawn is important to prevent damage to the developing grass. When starting a new lawn, the best time to add fertilizer to the soil is after removing any plantings and weeds from the area, loosening and raking the soil and adding soil enhancements, prior to planting the new lawn. Once the fertilizer is evenly distributed throughout the soil, then it is ready for the new grass. Once the new grass is planted, the next fertilizer application must be six weeks later, according to the University of California. 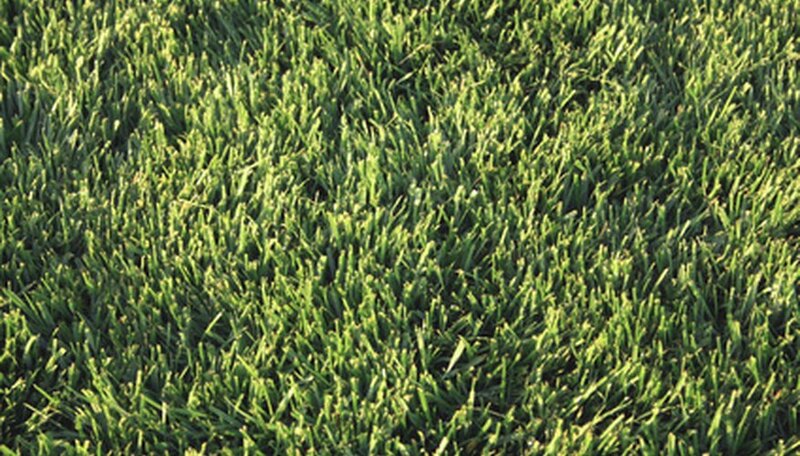 Fertilizers added to new grass in its early stages can cause damage to the grass. Nitrogen is the most important component of lawn fertilizers. According to Colorado State University, the presence of nitrogen in the soil is responsible for grass color and healthy growth. According to the University of Minnesota, phosphorus promotes root growth and increases the grass growth rate, and potassium in fertilizers supports the formation of plant parts and helps the grass, and other plants, effectively use nitrogen. When the newly established lawn is ready for fertilizers, they are best applied in early to late spring and in late summer through early fall when the grass is still green, according to Colorado State University. Fertilizers are generally not applied in the hot summer months, except for grasses such as bermudagrass and buffalograss, and they are not applied in the winter. An advantage of mowing the lawn without a collection bag is that the grass clippings can fall to the ground and add nitrogen and other nutrients to the soil. Grass clippings will reduce the amount of nitrogen-containing fertilizer that the new lawn will need, and since it does not create thatch in the lawn, this is an eco-friendly way to a healthy lawn. Avoid lawn fertilizer burn by avoiding applications during the sun's peak hours. According to Plant-Care.com, the "burn" is caused by the salt composition of the fertilizers on the grass blades. Even distribution of fertilizers is also important for new lawns. New lawns do not need an abundance of fertilizers, especially if the soil was enriched prior to starting the new lawn.